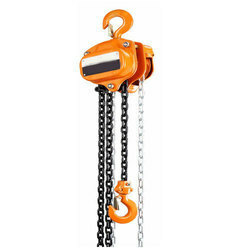 Our range of chain blocks are extensively used in industrial applications, we offer the brands `indef’ & `w’. these are fabricated using quality tested material and ensure long service. Our range of Industrial Chain Block is available in different capacity and used for lifting heavy loads in various industrial like construction, engineering, automobile and marine sector. We are well known suppliers prominent range of Chain Pulley Block. High quality raw material, latest high modern technology and machines are used in the manufacturing by talented and experienced professionals. We are a leading manufacturer and exporter of Iron Pulley Blocks. Fabricated from finest quality raw material, they find diverse application in various industries. chain blocks offered come in durable construction finish and provides for optimum functional usage support as demanded by the customers. Victory Machinery Corporation is one of the leading supplier of chain Pulley blocks. Our clients can avail from us abroad range of Chain Pulley Block, which is assured of quality and interchangeability of parts. In order to deliver assured safety levels, we have tested our range for 50% over load. In the rigid German design of our machine, double ball bearing are provided to support the load wheel for smooth operation. 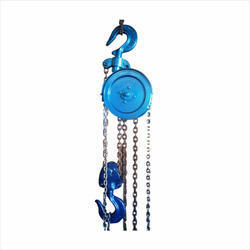 Poonawala Machine Tools is one of the leading supplier of Chain Pully Blocks.